This photograph shows Tubman as a young, stylish woman, museum Director Lonnie Bunch said. Most photos seen of Tubman have been in her later years. A rare photograph of Harriet Tubman is now on display at the National Museum of African American History and Culture in Washington, D.C.
Curators believe this is the earliest known photograph of the Underground Railroad leader. NMAAHC Director Lonnie Bunch said that this photograph shows Tubman as a younger, stylish woman; most photos seen of Tubman have been in her later years. 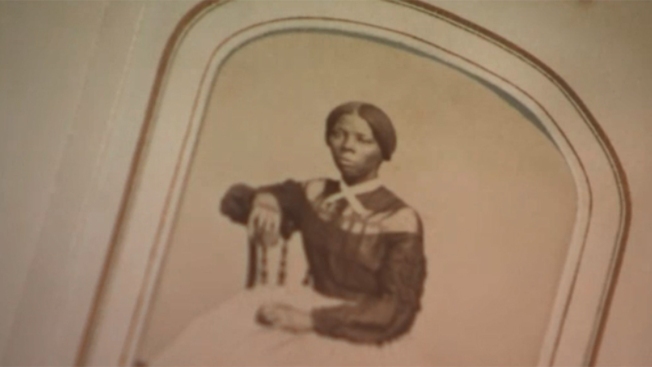 The photo shows Tubman in her late 30s or early 40s, taken sometime in the 1860s in Auburn, New York. "This photo helps us humanize her, helps us see her as a woman of middle age, but a woman with strength and stamina," Bunch said. "And so, for me, what this allows us to do is to tell a fuller, richer story and help people remember Harriet Tubman not so much as an icon as a human." The image is contained in what is known as the Howland Album. It contains photos of historical figures in the abolitionist and activist movements. The museum and the Library of Congress teamed up to purchase the album at auction. It had belonged to Emily Howland, a lifelong advocate of women's rights and the freedmen's schools. Library of Congress conservators repaired the album and preserved the photographs, including the rare Harriett Tubman photo. "I felt like this is the museum's version of a Mona Lisa," said Rhea Combs, curator of photography for the NMAAHC. "This is our Mona Lisa. She would be the equivalent." The photo is on display in the museum's main hall this week and will then be moved to the "Slavery and Freedom" exhibition. The entire album contains 49 images taken in or around the 1860s and includes photos of Sen. Charles Sumner, women's rights activist and abolitionist Lydia Maria Child, organizer Samuel Ely, William Henry Channing, Col. C.W. Folsom, Charles Dickens and the only known photograph of John Willis Menard, the first African-American man elected to Congress. The entire album contains 49 images taken circa 1860s, it also includes photos of Sen. Charles Sumner, woman’s activist and abolitionist Lydia Maria Child, organizer Samuel Ely, William Henry Channing, Col. C.W. Folsom, Charles Dickens and the only known photograph of John Willis Menard, the first African American man elected to the U.S. Congress. Two of Tubman's descendants were also at the museum for the unveiling. "Wow, because I have only ever seen the older ones when she was older and after she had moved to New York," said Deborah Brice, a descendant of Tubman who lives in Alexandria. "Like the gentleman said, she was frail. So, to see her young and vibrant, that's exciting."